Starting June 15, 2018, visitors to San Francisco will have an exciting new window into the remarkable coast redwood forest. At the California Academy of Science’s new Giants of Land and Sea exhibit, you can explore the forest canopy virtually through an immersive video experience, walk through a fog room to feel how this fixture of coastal climate bathes the redwoods during the summer, and learn about the intrinsic connection between the forest and Pacific Ocean. Every corner of the exhibit reveals the bountiful biodiversity found in the redwood forest and how scientists, conservation groups like us, and the Yurok tribe are helping to protect the forest and it’s many special inhabitants. Save the Redwoods League helped bring this exhibit life, sharing secrets of the forest’s ecology that are now accessible in four languages (English, Spanish, Chinese, and Filipino). An enormous trunk section from a fallen coast redwood is on display, enabling visitors to examine its tree rings firsthand and learn from our Redwoods and Climate Change Initiative scientist, Allyson Carroll, about this tree’s remarkable 800-year lifespan. The canopy ascent video also features League-sponsored researchers giving a sneak-peak into their fascinating studies of the redwood treetops and how they brave remarkable heights to discover how these forest giants provide such excellent habitat hundreds of feet above the forest floor. I hope this exhibit shows you another side of the coast redwood forest and inspires you to plan your next hike among the trees. Learn more about the Giants of the Land and Sea exhibit at the California Academy of Sciences. 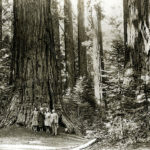 And for help planning your next adventure out to see the gigantic redwoods in person, visit ExploreRedwoods.org. On June 8, 1906, exactly 112 years ago today, the 26th president of the United States, Theodore Roosevelt, signed the Antiquities Act into law. It was this act that allowed the protection of places such as Muir Woods National Monument. Education Grants Program gives $100,000 every year to various schools, non-profits, and parks throughout the redwood range to enhance redwood education programs and bring more people to our iconic forests. Hi Emily. I am a caretaker of 640 acres Of mixed Redwood Forest just North of PhiloCalifornia in Anderson valley. The property was last logged back in the fiftys..So a lot of the trees must be around 100 years old. We do not want to log but paying for taxes, insurance, road maintenance, etc.is becoming harder each year. Would it be possible to pay for our expences with carbon credits by keeping the redwoods in the ground.. We are also looking at putting the property into a land trust. I would appreciate any thoughts on this matter. Thank you for the comment and for caring for the redwoods! I’d recommend contacting NCRM (North Coast Resource Management), a company in your area that could assess the viability of a carbon project on the land you mention. https://www.ncrm.com/ I hope this information helps!